After trading for a while and posting my previous posts in 2008, I have decided to find out new experiences with eToro in 2010. So I started my research again in January. As you know I have posted few posts already about eToro this may be a good time to see what (if anything) is different with eToro. I have been trading since 2005 with different platforms and eToro was one of them that I liked a lot because of its simplicity and user friendliness. Later part of 2008 I took a break from online trading all together. However I have not stopped researching eToro and other trading platforms including metatrader. If you know what you are doing, I think eToro is the best platform by far, for novice, intermediate, and experienced traders. It sure has come long ways since 2008. What struck me right away with my new experience is that eToro now allows you to trade in two different ways. One is Software that you can download and another one is the web trading option. In this article (to keep it short and to the point) I will only talk about the Web Trading platform. Software based platform will be discussed on another article. 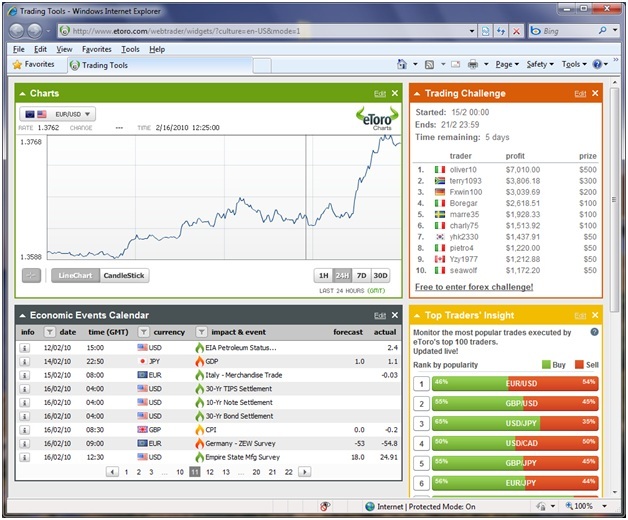 What I like about eToro’s Web Trading Platform? You can execute your sell or buy orders, You can deposit money, you can view the history of your past transactions, and you can add news widget. This news widget is great because you can see whats happening in the market right away. You can also chat live with other traders. This also gives you the option to filter out the currency pair you don’t want to see. 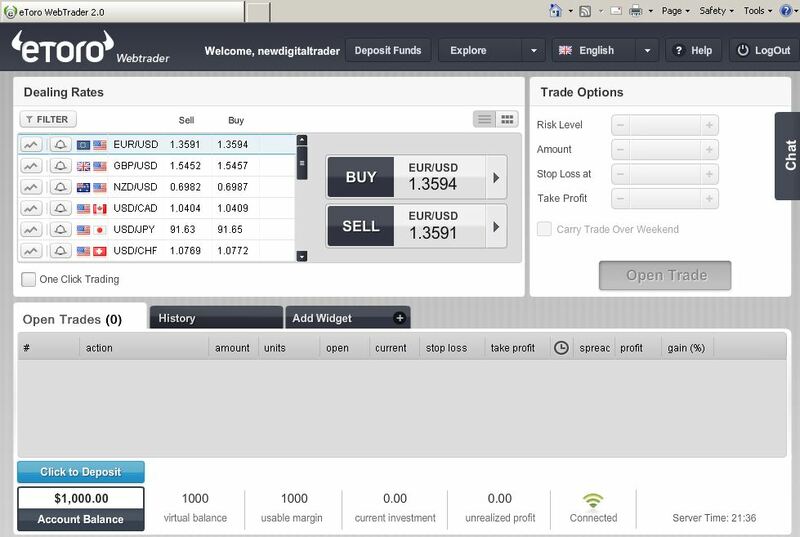 For me that is great because I can customize to see exactly what I want on my eToro web trading platform. Another great addition to eToro trading platform is the ability to trade commodities. Right now they allow you to trade Gold and Silver. This allows you to view charts of any pair you wish, you can see trading challenge results, you can view the Economic Events Calendar that allows you to view market news and plan you next strategy. You can also view Top traders’ Insight to help you make your own decision. All of these is just one click away on single screen. To customize the look according to your preference it also allows you to change color or looks of it by simply clicking on the Edit option on each of the windows. Ok, so those are all cool features, it really doesn’t matter what platform you use, but if it doesn’t help the traders in making money then it’s worthless. From my own experience I have found this to be an excellent way to make money. Of course there are risks but you have to know what you are doing. If you do that then you are fine. How does it help traders make money? Well, first of all it allows you to set your stop loss limit. You can set it to any amount you want. It also allows you to execute trades automatically. You just set it up so when it hits certain level of price it will execute the trade for you automatically. Their pips are very comparable with other trading platforms. I would say sometimes they are lower than others. They also have an excellent team of helpers who will help you all the way through your trading. During my research, I have noticed both negative and positive comments about eToro. However, my experience has been very positive. Well giving bonus is a way of getting more customers but they help you in getting the most bonuses you can get from what you deposit. You can get up to $1000 bonus. eToro has different programs to mathc your personal trading style. Some other features of eToro. It doesn’t cost you any money to trade on eToro. They way they make money and bring you all the features and benefits are by pips. When you buy or sell currencies you are doing so based spreads. They get certain percentage of that. Again this is very reasonable from what I have researched and found. This pips are also comparable and sometimes even less compared to other bigger platforms such as metatrader. Now the question comes, are they legit? Yes eToro is absolutely legit. Just view their contact page and you will see they have offices in different areas of the world such as, USA, Canada, Argentina, Brazil, Panama, United Kingdom, Greece, Turkey, Finland, Spain, Italy, France, Russia, Ukraine, Germany, Malaysia, Bahrain, Jordan, and Australia. When I was researching, I personally called USA, Canada, Germany and Australian office. I chatted with people there just to see if they were there or it was just some random numbers. To my disbelief I found that people actually answered the phone. They also have physical offices in the USA and Australia. Final Thoughts about eToro and my recommendation to everyone? I have to say I am very impressed by eToro. Again, as an independent trader, you must face some risks, you may even lose money time to time, but that doesn’t dictate your entire experience or your entire view. If you lose today you will gain tomorrow. As I said earlier I have been trading since 2005 and I have lost over $10,000 in total. With eToro alone I lost over $2000. Does that make it a bad platform? Of course not! I lost because I didn’t know enough about trading. I got the emotion get the best of me. So take out the emotion, use a strategy and you will make decent earning from this. I would recommend, you try the practice account first. Have a strategy. There are lots of writings out there about forex trading strategy. Just find one that best fits you. Consult with eToro advisors. They are there to help you and have fun with it. If you are careful and clever you will enjoy eToro better than any other online forex trading platform. Download! Good luck! Start Having fun! Earn money with eToro! I have been trading on forex for over 6 years now. I thought I would share some of the resources I have used to make stead profits in Forex. Cautionary Note: Please use this information at your own risk. Forex trading is not for everyone. Before you invest please learn as much as you can and learn of the risk. I am from Malaysia and using etoro for over 4 years with no troubles. I love etoro. very easy to use and great way to earn living. Thanks for that comprehensive intro & overview for webtrader.